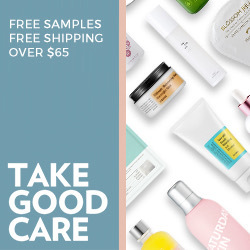 While the last cocktail on the blog remains quite the hit, it’s time to move on to something new. Let me switch from gin to rum for this next recipe, and not just any rum, but spiced rum! 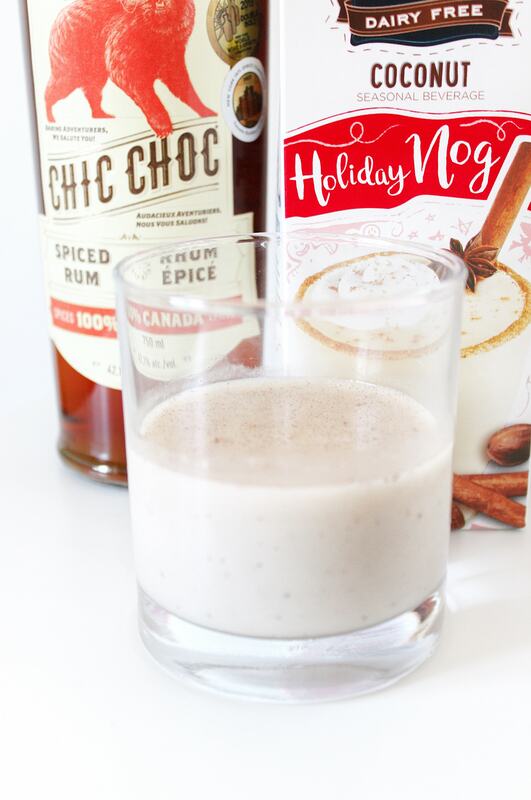 The spiced rum I am using in this recipe is the Chic Choc Spiced Rum. Spiced rum is one of Matt’s favourites to use in mixed drinks, but I’m putting a holiday twist on this cocktail. Since it is less than a month until Christmas, you may have already figured out that we are making eggnog. That, and that it was in the title – clearly. A little backstory to this drink: I have never tried eggnog before. It never appealed to me growing up, and then the dairy allergy kicked in. I finally wanted to try it and it became harder to access. This is where the So Delicious Coconut Milk Holiday Nog comes into play. 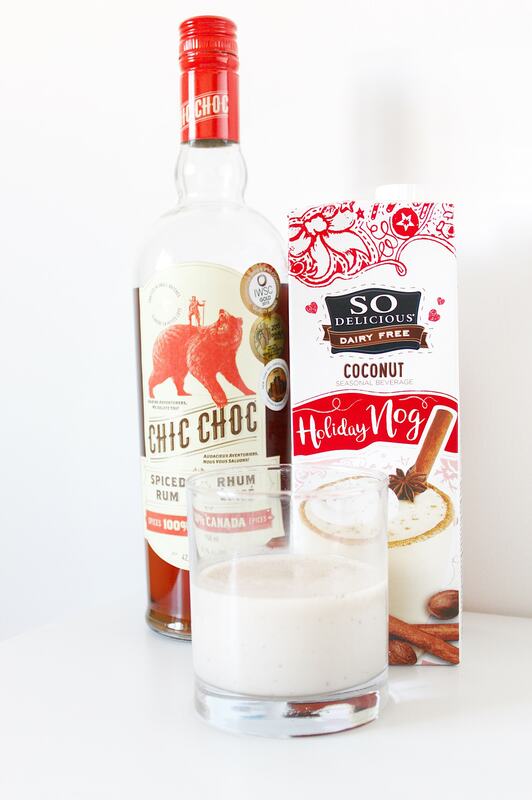 As long as you do not mind a slight coconut flavour to your eggnog, you will get along with this vegan eggnog option just fine. Some people like eggnog as is during the holidays, but others prefer it with a little extra something special – like rum. I thought the spiced rum would be the perfect pairing to kick this eggnog up a notch. This spiced rum is a special blend of spices to create its unique flavour. This blend is a mixture of peppering green alder, pine forest spikenard, witherod berries, lovage root, sweet galeseeds, and wild angelica. Fill the rest of your glass with eggnog. Sprinkle spices on top – I went with a pumpkin spice mix to incorporate more flavours. Add a cinnamon stick if you wish to be extra and make your drink look even more festive. Are you a fan of eggnog? When you get eggnog, do you buy in from the store or make it from scratch at home? I have seen a few recipes and am tempted to create my own to see how it tastes without the coconut milk flavouring. This vegan eggnog is definitely helping me feel that the holidays are really setting in now and I couldn’t be more excited!